Most will recognize that the word bog might mean many things. Here, especially in south Texas the word calls to mind a swamp that is “swampier”, perhaps with a little quicksand lurking beneath the green duck weed, and the faint odor of rotting vegetation. In England the bog means different things also, not only a type of swampy marsh, but it could mean a toilet. It isn’t a nice word for toilet, more a derogatory term. The English have many words for toilet. If you visit, you could ask for the toilet, or the loo, or the “ladies” or the “gents”, only don’t call it a bog in polite company. This week I had a bog experience of the worst kind. Upon waking and getting busy around the house, I found the vacuum had broken, then as I was taking some paperwork to a certain government office to drop off, I discovered their offices closed due to flood. (No it didn’t rain. It was either a toilet overflow or a pipe burst type of flood.) So I had to drive back across town to await their office re-opening. I discovered in an email communique that the offices were open so I drove back. AND I’ve never seen such a line. I think it was the day to turn in papers, or something. At other times I have parked, walked in, handed in the papers, received a signed receipt, and walked out. That day I stood in line. After hour one I was well acquainted with a nice family who were in front of me. By hour two we had exchanged email addresses, by hour three we were discussing the politics of the world and specifically France’s responsibility in the Vietnam war. It was during this time that my renter called. She had just moved in and the next morning when her son was showering she discovered water coming from beneath the toilet. Later when she was washing up the dishes, her sink wouldn’t drain, later she was bathing and noticed black stuff coming up from the drain. Then the tub wouldn’t drain, and yes more black stuff. I don’t want to write anymore about that. I have a handyman who works on most everything to some extent. I asked him if he would go “snake” the trap line. The ‘snake’ is a long wire with a type of bent pipe at one end so that if you drop the wire into the line and wind it, it should squeegee out the blockage. The ‘trap’ is a pipe sticking above ground that leads to the intersection of all the main drain lines underground. He went after work and did that and said he could find nothing. During all my adventures in house renewal and fixing up, which we’ve been doing for almost two years, my main disappointment is in finding a good plumber who was half-way affordable. And this was an emergency. My renter has young children. “Yep, over there.” He pointed, and didn’t move from his spot. This is top-secret stuff that we’re talking about. I figured Milton must be on some supervisor’s “watch” list or something. I have a name now and I determine to come back the next day. He pulled a couple of boxes off the nearby shelf and opened one of them, emptied out the various parts to lay them out on top of another box, and spoke into the open end of the now empty box, “I’ll need your number so I can call.” I gave him my number and the address of the house. He said he knew just where that was. He said he would call me after work and meet me over there. He would start work immediately. I went home to await his call. He called. He set a time that he would come with his crew. They showed up and flushed the lines from the bath (Ack! Ack!) and the toilet and discovered that the trap was clogged with cement. Apparently when the previous owner poured his porch slab, some of the cement went into the trap. Whoops. It dried in little hills forcing the exiting waste to have to squeeze through. Or not. The next few days he was able to come with his crew and dig. 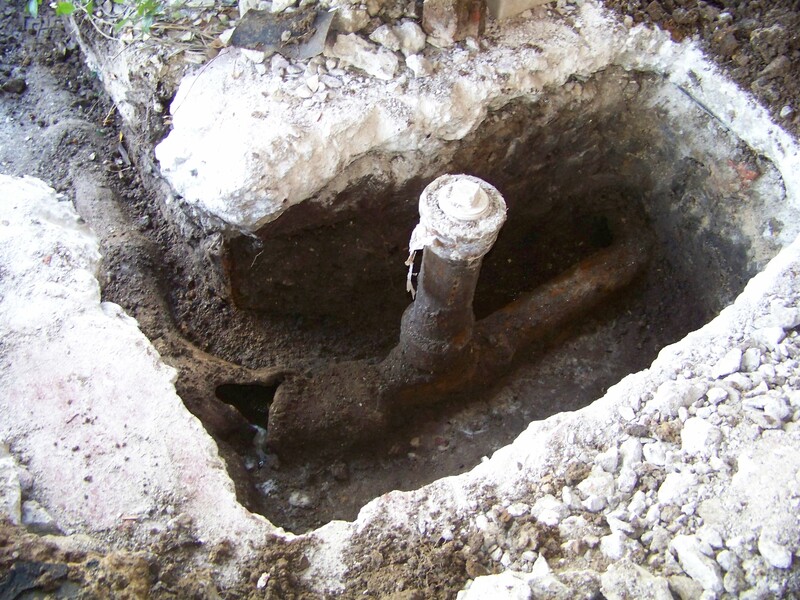 Thirty-eight feet of pipe was replaced. He discovered on uncovering the pipe nearest the house that the palmetto bugs were rushing out of the hole by the hundreds. The palmetto bug is a relative of the common roach, only they are about three inches longer. Almost the size of those Madagascar Hissing Roaches. Yuck! I hate palmetto bugs! He said that the reason there were so many is because the pipe was actually broken. They like the broken sewer lines. Double Yuck. So tonight I report that the bog is finished! done with! FINIS! Except I can’t because the renter just called and her sinks won’t drain. You have such a way of telling a story!!!! This was hilarious…only I know not….. Thanks for sharing sweet friend!